A lot has happened since May, most of it not relevant to this blogette about discos and music and playing vinyl in the South of London. But aren’t you desperate to find out what happened when Bazooka Joe’s came to The Talbot for the fun and popular local festival Brockley Max? The photos say a lot (mostly thank you to the ever generous and talented Jay Alix). As you can see there was bingo and Barry, synchronised disco dancing (thank you Ken and Matilda), nylon and nibbles and generally a lot of good fun. The Disco Phone rang, and I like to think we answered it. Here are lots more silly pictures. 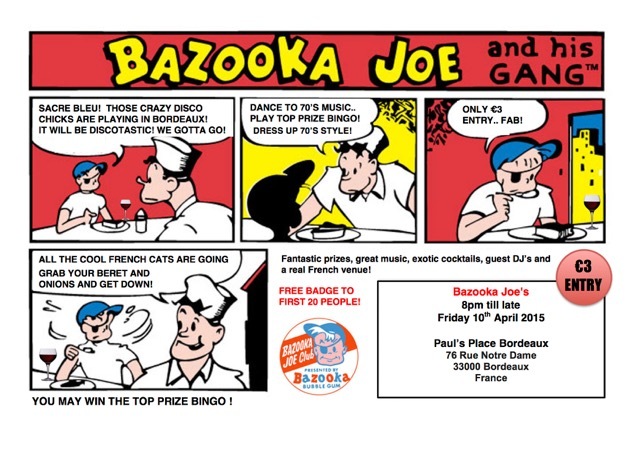 If you had came and had fun, please do comment, or if you have a venue and are looking for a fun night of retro 70s entertainment, get in touch and we will bring Bazooka Joe to you. Our thanks go to the friendly venue, to the festival organisers of Brockley Max. and most of all to those of you who came, old timers and new friends. Looking forward to next year… if you’ll have us. The thing about Freetime is that you never quite know what to expect. Apart from good music of course. 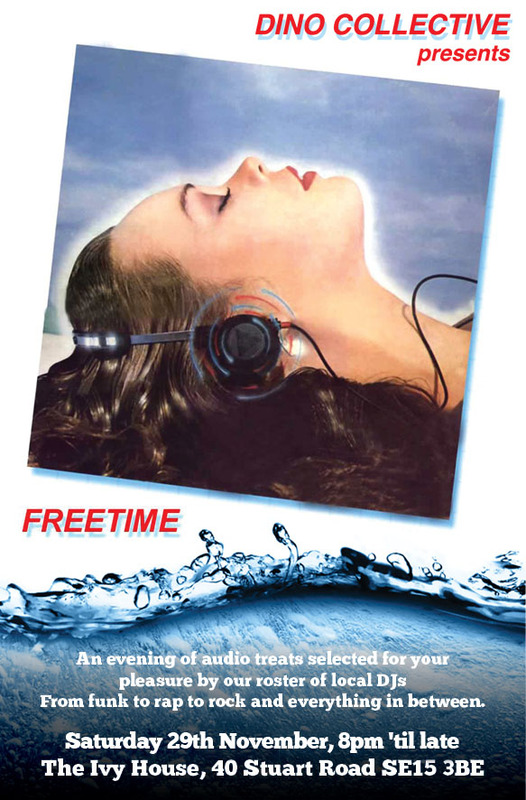 Freetime is the one where we get to play what we want. No theme, just a space to play stuff, where you get to come and hang out with us in your ‘freetime’ if you want to. No pressure, nothing to pay on the door, just nice friendly vibes. On Friday we were back to our favourite Freetime venue, the Ivy House, which has been saved by the people and is London’s first co-operatively owned pub, and all the more special for it (quick confession, I am a shareholder, but that doesn’t mean any of the above is untrue). Music-wise we played Audio Bullys to Congo Natty via Marvin Gaye, The Beat and Ibibio Sound Machine. Kit-wise we got through two mixers and three decks, having to make a quick detour home mid-set to pick up our own equipment. We played everything on proper old vinyl. Dancers were typically shy at first (apart from the ‘there’s always one’ guy who couldn’t sit down from the off) but by the time we got to the jungle face-off between djs D Rex and Kamakiri, everyone was a junglist and was forming circles to out-skank each other on the dancefloor. We had some winners in the crew who had travelled from Cardiff to spend some freetime with us, but there were definitely a few contenders! Technical hitches aside, we had a blast and here comes a massive big thanks to all of you who joined us. It was a lovely mixture of regular Dino Collective fans, old pals and I think we made a few new ones. Welcome to Freetime courtesy of Dino Collective, and if you want to keep updated, you can subscribe to this blog or join our Facebook page. Here are some photos. Comment if you see yourself! 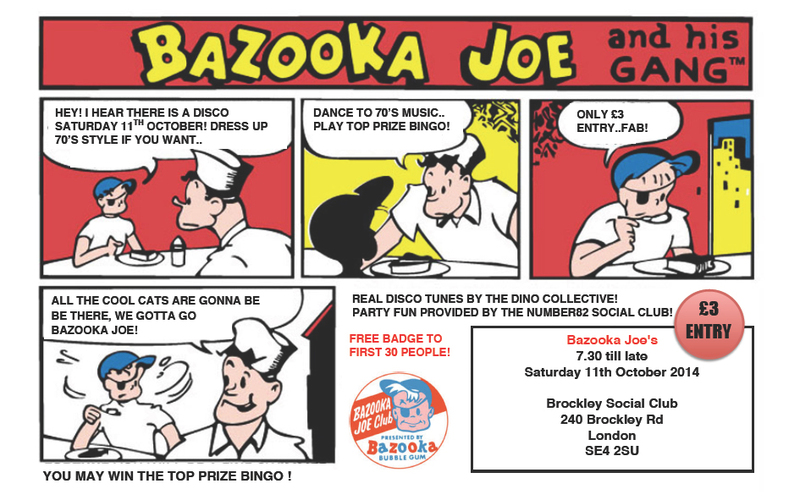 The return of Bazooka Joe’s to the Brockley Social Club came along faster than you can pop a massive bubble of gum. The party people of Brockley turned up in their glad rags, multi colours and 70s tank tops and joined us for 2 rounds of bingo and an aperitif of cheese and pineapple on sticks, before dancing the night away. Our impeccably dressed guest DJ, Mr Francis aka Captain Disco, did us proud with some funk and soul on the dance floor, and DJ Mental Floss got the ladies dancing, and even some of the men, with some real disco classics. The niftiest moves came from the oldest dancers, who everyone else tried (in vain) to copy. Those feet were just moving too fast; the nimble turns were executed so lightly – it was wonderful to see a couple who have plainly spent a lifetime dancing together with such enjoyment. Nobody recognised Debs ‘the Dealer’, our wonderful bingo caller, once she had put on her (third) wig; in fact a few rumours went about that it was Debbie Harry who had turned up in Brockley in a shiny lurex jumpsuit. Whichever Deborah it was, she dished out some unforgettable prizes, as usual. Top prize tonight was the bumper 1975 edition of the Family Fortunes board game. What a lucky winner. So lucky that she gave the prize back. Huge thanks go to Angela for the wonderful gigantic hedgehog that she made, absolutely stuffed with cheese, pineapple and grapes, and with licorice for eyes. It’s thirsty work doing disco dancing, and this fruity mocktail went down very well indeed. I went back for more, to find just the polystyrene carcass winking sadly up at me with a few remaining wonky sticks. It was such fun, being transported back to that old era when most of us were kids. We are off on our European tour next, stopping off at Bordeaux don’t you know, and you are all invited. A new city starting with B, a new Guest DJ on the horizon who I know will get you all dancing comme des fous. But if you can’t make it to la belle France, you will join us, next time we pop back to Brockley, n’est-ce pas? You can click on any of them to see them better. Apart from a few taken by me, photo credits and big snappy thanks go to Jay Alix, with selfies by Shermin Arkut/Ruth Spencer and Laura Kinnunen/Gerald Francis. As ever, if you have any good photos from the night, please send them my way! We have just announced our second coming (on the 7th February). For some of you that may mean nothing. So please find some photographs from our first coming, in October of last year. I was remiss and didn’t post them at the time. It was a mild autumnal day and evening and we had a lovely time dressing up the social club and then dressing up ourselves. You’ll see more of the former than the latter in the photos (due to darkness) but that’s probably a good thing as we looked very silly. Well I looked alright but you should have seen my Northern cohort and bingo-caller in her many guises and hair pieces! A little bundle of you conga-ed in, all at around ten to nine, we played bingo for some brilliant prizes, and then we disco danced the night away to some classic 70’s tunes. Bazooka Joe’s returns to the Brockley Social Club on 7th February 2015. All welcome, so do please join us! 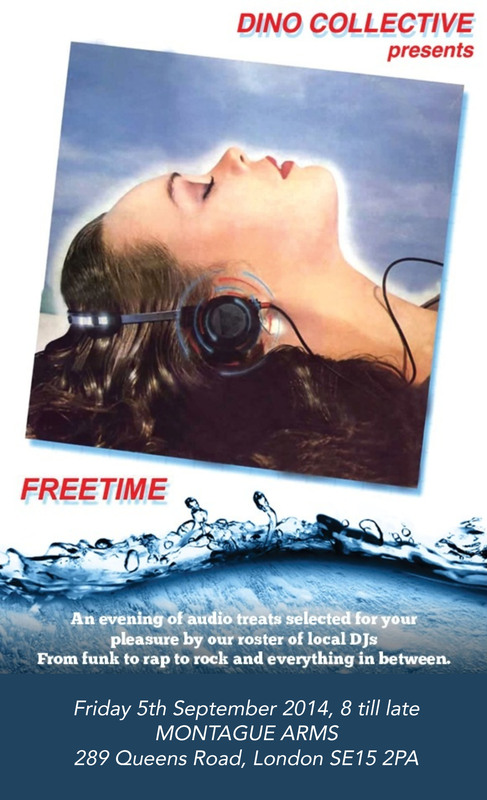 8 till late, just 3 pound coins on the door, no need for advance ticket or RSVP or queue round the block. Feel free to dress up, 70’s gear or otherwise, but feel no obligation. Does anyone remember our gig last November at the Ivy House? We are doing a re-run this year. The date will be Saturday 29th November. Mark this, my friends! Here are some photos to remind you of what went down last year. You might remember mingling with a few famous faces. And a few moustachioed, be-wigged faces too. After all, November is also Movember, and we welcome facial hair of all kinds. Enormous thanks to brilliant local photographer Jay Alix for the fun pictures. Now go grab your posse and make arrangements. See you on the 29th, same time, same place. Believe me, it is a very good way to spend your Freetime. We had such fun last weekend, watching St Elmo’s Fire and having an 80’s disco afterwards, at this, our first official event as the entity called ‘We Do Good…’ The idea is that the strapline changes according to the event. In this case it was We Do Good 80’s Disco, Film, Badges, and Hair Crimping! The main surprise of the evening was how many of you wanted to come into the ‘Crimping Salon’ to have your hair done. We may have to invest in another set of crimpers! Also, towards the nether regions of the evening, we found a few of you had snuck back in there to re-do your lovely 80’s make up and touch up your crimps. We will definitely bring this back next time, and with improved lighting! It was both comical and alarming to find out quite how much our reaction to St Elmo’s Fire had changed in the intervening 30 (!) years since first watching it as teenagers. I had no idea that every main male character had such appalling behaviour! I think I was just stunned by the beauty of Rob Lowe (which I still managed to enjoy, despite the lines he had to say and the way he treated his female friends). Big shout out to Sarita, my friend from school who I watched all of the 80’s teen films with first time around: she lives in deepest Kent but she still managed to join in and make it to the party. Before sharing some photos I just want to say a big thank you to all of you who came. It’s you who made it so much fun. We will be back with more of the same! For now, either keep in touch on this blog or at our new Facebook page: We Do Good Disco. We will shortly be popping up at the Telegraph Hill Festival with a silly event combining our two passions of bingo and disco, which will be called (wait for it) Disco Bingo. You can buy tickets for that here. You can click on any photo to see it better (if you dare) – let me know if you want any photos to be removed. Thanks to Ruth and Emma for some of the photos. It had been a year since we’d put on an event together, but on Saturday night we were well and truly back – and this time we sold out (in a good way). From the team of two who packed a disco bag and took a 70’s party to Bordeaux, and who in the past have thrown 70s parties at the Brockley Social Club and 80s parties at the Hill Station Cafe, we brought a slightly new format to the Tyrwhitt Road end of SE4. This time we visited The Talbot and screened Pretty in Pink the film, in its 30th anniversary, and squoze in a quick disco of all our favourite songs from the decade fondly known as the Eighties. What a trip down memory lane, to reacquaint ourselves with the characters of Andie and Duckie, Blane and Steff. 1986 seemed so long ago and yet so oddly recent all at the same time. I’m not sure how well the film stands the test of time, as I’m blinded by the nostalgia and the number of times I watched it back then (aged a tender 14). However you can’t beat a good boy meets girl from the wrong side of the tracks storyline, especially adding in that smarmy turn from James Spader in the unbuttoned shirts and linen suits, and the fantastic character of Duckie played so beautifully by Jon Cryer. Every fashion moment is, literally, unspeakable, and Iona is a great character who provides a lot of the laughs. Of course, the anti-bullying theme of ‘I just want to let them know that they didn’t break me’ will never age, and Molly Ringwald plays the quirky Andie just right, and we totally love her for her oddness. For others, there was the thrill of Andrew McCarthy, but I just never did get him and his thin lips and weedy smile. After the screening we tried to do a fast turnaround and our little screening room became – whoosh! – a dance floor. The requests came thick and fast and, believe me, we did try to listen and play to the crowd, but there are some limits! Including time limits! So please come back next time if you didn’t hear your tune this time. We promise to be back and we are also taking requests for which film you want to see next (comment below, also if you want to be on the mailing list). Thanks to all of you who came and had fun with us. We are very grateful to the lovely pub The Talbot for having us. We also raised some money for the fundraising campaign for next year’s New Cross and Deptford Free Film Festival which you can read about here, oh and for details about the NXDFFF itself see here. We have just started meetings for next year’s festival, so you’d be just in time to get involved. Brought to you by No82 Film Club and Dino Collective. On Twitter you can follow us here and here, and on Facebook you can like us here. Get in touch if you want to join our mailing list. We promise to only bring you emails which we think you will enjoy. No ticket required, no entry fee. 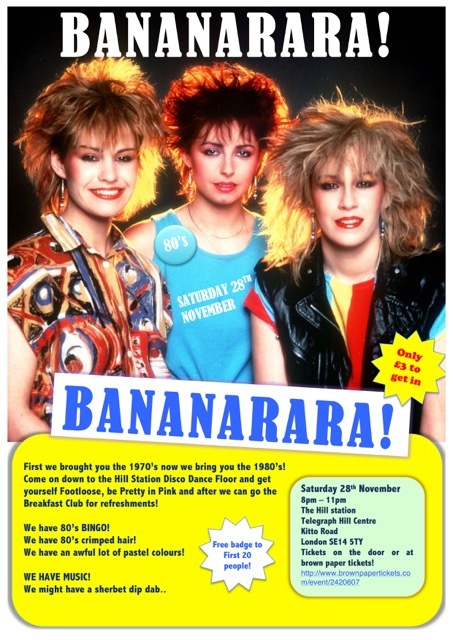 Bananarara is a new evening based on the music of 80’s pop, brought to you by public demand. From 70’s extravaganza Bazooka Joe’s, we have moved on a decade to bring you the best of the 80’s, whilst not forgetting the same happy, feel good atmosphere. You might not even realise that you like 80’s music – many people curl their lip Billy Idol-style at it, lumping all of the chart hits into one big 80’s memory. But on preparing the night I remembered and relived just how much good stuff was written. And it was going to be a challenge to fit the best into the time we had on the night. You know, there was tons of good music during the 80’s, whatever ‘tribe’ you were. Apart from the pop music, there was soul, punk, goth, grunge, ‘Madchester’. But let’s face it, at Bananarara we stuck to what people come to an eighties party for. And seriously, with this much time between then and now, it was so great to dance (and sing) along to the hits again, even if I had heard them (and tried to tape them from the Top 40 on the radio onto a portable cassette player) at least 42,000 times back then. Some of the most legendary music stars EVER made their name and, arguably, wrote some of their best tunes in the 80’s: from Madonna to Prince, from Michael Jackson to Elton John. I can’t even say if I liked it back then (but aged 11 I really remember watching the video on TOTP) but playing I’m Still Standing by (now Sir) Elton John just felt so right. On the night itself we were delighted to celebrate two birthdays (a real eighteenth! and a cough twenty-first). Many happy returns to Yewa and Angela, thank you for bringing your own party to us – but Angela, don’t think we didn’t see you sneaking off with mini chocolate bars in your pop socks! You may not ‘approve’ of nostalgia but we believe there is nothing wrong with it, not only can it be fun but it can also be life-affirming and positive. We wanted to remember the old days happily; it was ridiculous how many of the lyrics have stuck with us all for so many years. Then again, I was age 8 to 18 during the 80s. No wonder it had such an impact on me, at such a formative time in my life, and despite turning my back on it for some years, I am so pleased to be back. We will return with another Bananarara and I promise you we will play Footloose, Fame and all the other dance-related songs starting with F that you requested. Thank you to everyone who came to the inaugural night, yes all of you lot who dressed up and did brilliant air-guitar and singing with us (it was especially great to see all three of you men, thank you for dressing up so perfectly – I’m not going to forget the appearance of Phil Oakey for a very long time). See you in 2016 for more lacy cropped tights and shoulder pads. Come on (Eileen) have a laugh at the photos with me and see how many Madonnas you can count. With thanks to the Hill Station for the warm and friendly venue. Happy Christmas and here’s to more music, singing and dancing in the next year.